Maritime NZ describes a fire in the cargo hold of a container ship caused by the heat from a 500 watt light bulb as the ship was berthed in port on New Zealand’s East Coast in late 2017. Maritime NZ has published its Lookout report. In it they present a range of of maritime casualties, offering some clear lessons that have been learnt. 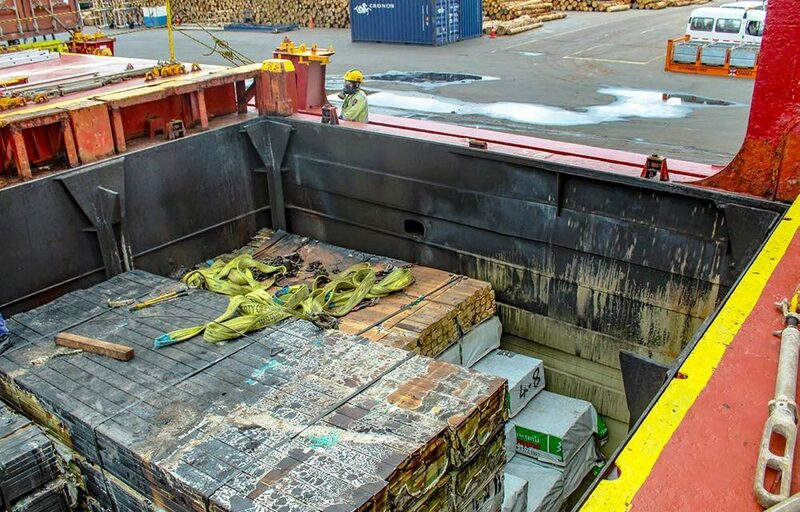 In this incident, Maritime NZ describes a fire in the cargo hold of a container ship caused by the heat from a 500 watt light bulb as the ship was berthed in port on New Zealand’s East Coast in late 2017. The cut timber had been loaded during the day and the 148 metre vessel was due to sail at the change of tide, when the cargo hold fire alarm sounded just before midnight. Crew donned breathing apparatus to check the site, and reported smoke coming out of Hold 4. The fire service was called, with multiple vehicles and firefighters responding. Meanwhile, crew released CO2 gas into the hold via the fixed fire suppression system, and shore firefighters used hoses to cool the boundary when they arrived. Nearby dangerous goods containers were moved away by crane, and the temperatures of the hatch cover and adjoining bulkheads were monitored. All containers from on top of the hatch were moved to reduce any risk of the fire spreading. A couple of hours later, crew released cleats on the hold hatch, but replaced them again when heavy smoke poured out. A final decision was made to wait and leave the fire to be smothered. More fire suppressant CO2 was used. Later that morning, around 11am, the hold was opened up, while fire crews and a fire tug stood by. Damage was found to be limited to the bundles of pre-packed timber. The burn pattern on the timber and bulkhead showed that the origin of the fire was a fixed floodlight, in a recessed cavity, that had been left on. The floodlights provide lighting for stevedores to work loading and discharging cargo. The protective cage of the bulb is flush with the bulkhead, and the distance between the bulb and bulkhead is just four centimetres. It was found that one timber pack was loaded close to this potential hazard. A safety bulletin has been circulated to highlight the risks of high wattage lights and the suitable stowage of cargo – especially break-bulk cargo rather than containers. Break-bulk cargo is goods that must be loaded individually – not in bulk (such as oil or grain), and not goods in standard intermodal containers carried by sea, rail and road. – All PCBUs (Persons Conducting a Business or Undertaking) involved in ship operations have a responsibility to reduce the risks that are under their control. This is a requirement under the Health and Safety at Work Act 2015 (HSWA). 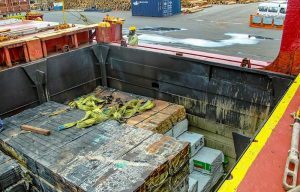 – Consideration should have been given, by both the ship crew and the stevedoring company controlling the loading operation, to the enhanced fire risk from loading wooden packages in a hold designed to take shipping containers. – Isolating the hazard by leaving a clear space between the light and cargo would have prevented the fire. – It could also have been prevented by ensuring all the lights were turned off once loading was complete, or if the 500 watt light bulb had been substituted for an energy efficient equivalent. – Since this incident, the operator has replaced all hold lights throughout the fleet with LED equivalent bulbs to eliminate the risk, even if a light is inadvertently left on in the future.